Precinct dramas – those set in a single limited space – have grown popular in the last few years, We’ve had thrillers set in one room (‘The Disappearance of Alice Creed’, ‘Exam’, ‘Cube’, ‘Fermat’s Room’) a great many set entirely in houses or apartments (of which ‘Amour’ is probably the best) horror films set in gas stations, in an underground car park (‘P2’), in a school (‘F’), a thriller on a concert stage (‘Grand Piano’) and another in a call box (‘Phone Booth’). One of the very best, ‘Buried’, was set entirely inside a coffin and scared the bejaysus out of me. The appeal is obvious. You only need a fraction of the normal budget and you can use the limitations of the set-up to heighten the drama. 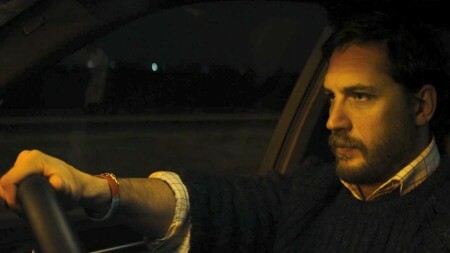 There have been a number set entirely in cars – I think ‘Feux Rouge’ was my favourite of those – but Steven Knight’s ‘Locke’ was a surprise because it wasn’t a genre movie, which instantly broadened its box office appeal. Tom Hardy played Locke, a man on the edge of his life’s greatest crisis, brought about by a moral decision which means he must decide to either follow it through or recant during the course of a stressful 90 minute drive to London. Hardy’s soft, lilting Welsh accent has the effect of calming down those on his bluetoothed speaker-phone as the crisis, involving home, loved ones and career, coalesces around him with dreadful force. It’s a thrilling ride, with only the odd blurry out-of-window shot to break the fourth wall – and that doesn’t relieve the tension because he’s driving at high speed. Precinct films usually fail because they make the viewing experience feel too airless, and the protagonist comes up with increasingly silly reasons for not leaving one spot. ‘The Last Days’, a Spanish SF film (reviewed elsewhere on this site) deals brilliantly with the problem, but I’ve seen two movies entirely set in toilets now, and both needed flushing. TV comedy-dramas like ‘Number 9’ are really stage plays confined to a single set, but the discipline is a good one. ‘Cube’, the original ‘Man In A Can’ movie, had two sequels that broke it out of the confined space and consequently didn’t work so well. You know you’ve got it right when the viewer doesn’t want to leave. Although it wasn’t entirely set within four walls, David Lean’s ‘This Happy Breed’ was an early precinct film, being deliberately set inside a single house between 1919 and 1939, and the film’s masterstroke is the emotional wrench of leaving at the end. What’s funny is that the original trailer uses every scrap of footage taken outside the house, thereby completely misrepresenting the film and making it look like ‘Cavalcade’. Other favourite examples of precinct movies welcome! Apart from this, thanks for raising this very important issue. Reading novels from different cultures enables you to understand the world a little better. Hence, a lack of good translations limits our world view and makes us one-dimensional. Potentionally very dangerous! There will be rows about what is exactly a precinct film! Just the one room? Or two, or three? External shots allowed? Flashbacks permitted? Hitchcock did a few: ‘Lifeboat’, ‘Rope’, ‘Rear Window’. ’12 Angry Men’ is mostly set in a Jury room. ‘Devil’ is a four-hander set entirely in a lift. ‘House of Nine’, unsurprisingly nine strangers, [all in need of a good slapping] are confined to a house. ‘Walled In’ A demolition company agent uncovers the horrifying secrets held within a building she’s having razed. Having got our feet wet, ‘Triangle’ or ‘Dead Calm’ perhaps. I never heard this term in my life. I came here expecting to read about cop shows and police precinct dramas. This sounds like an attempt to create something out of nothing. A story that takes place in a single setting suddenly is deserving of its own category? In the theater we call this a unit set drama. And it’s not a genre, it’s a budget consideration. You’re wrong, John; it’s been a standard term in British film and TV production for decades.